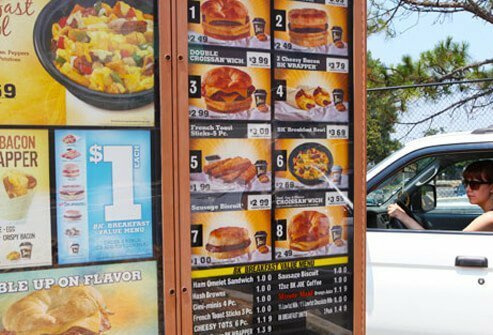 Breakfast from some of the nation's fast-food restaurants could be a high-fat, high-calorie affair. But most chains offer healthier options, too. Think about what you need: Even these "better bets" aren't for everyone. Some still may have too much salt or calories for you. Take a pass on the Big Breakfast with Hotcakes. It packs 1,090 calories, 56 grams (g) fat, and 19 g saturated fat -- over the daily limit for saturated fat for most people. Even the biscuit is loaded with saturated fat. The sodium hits 2,150 milligrams (mg), well over the daily limit of 1,500 mg for people who have high blood pressure or are particularly likely to get it -- a group that includes most U.S. adults. 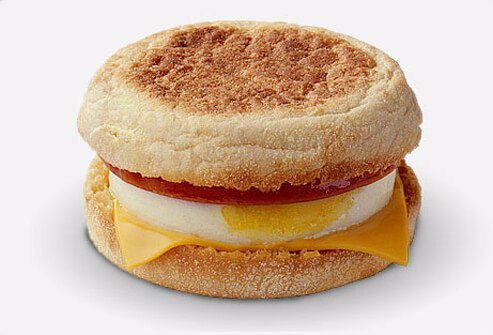 The Egg McMuffin is a better choice under the golden arches at 290 calories, 12 g fat, 5 g saturated fat, and 4 g fiber. Lean Canadian bacon offers protein and a meaty taste with much less fat. Note that it's high in sodium: 740 mg. You could choose the Egg White Delight McMuffin. It has 250 calories, 7 g fat, 3 g saturated fat, and 4 g fiber. But at 770 mg, it also has a lot of sodium. Skip the Double Croissan’wich with Sausage & Bacon, which comes in at 580 calories, 39 g fat, 15 g saturated fat, and 1,250 mg sodium. 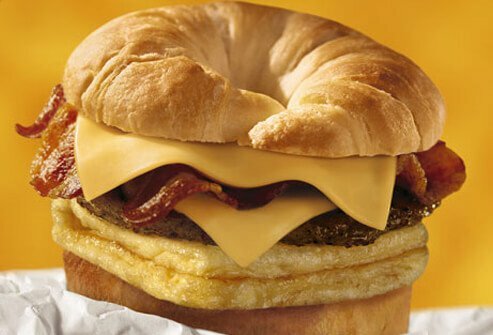 Burger King stacks a sausage patty, thick bacon, double cheese, and eggs on a giant buttery croissant bun. Another one to pass up: the Double Croissan’wich with Double Sausage. It has 710 calories, 52 g fat, 19 g saturated fat, and 1,160 mg sodium. 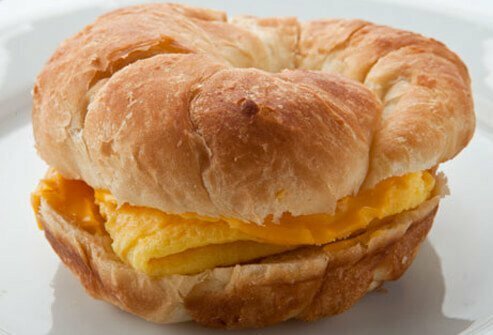 The Egg & Cheese Croissan’wich has 330 calories, 18 g fat, and 8 g saturated fat. The sodium count may be tough for limited diets at 620 mg. Eleven grams of protein will help keep you feeling full until lunch. Steer clear of the Steak & Egg Burrito. 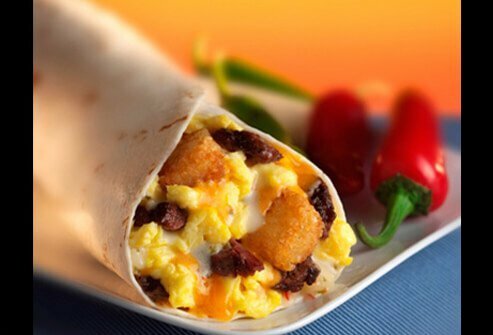 Jack in the Box fills a flour tortilla with scrambled eggs, steak, hash browns, and cheese. It has 788 calories, 48 g fat, and 14 g saturated fat, and 1,856 mg sodium. The burrito does provide 32 grams of protein, but it takes a big chunk of your daily fat and calorie limit. 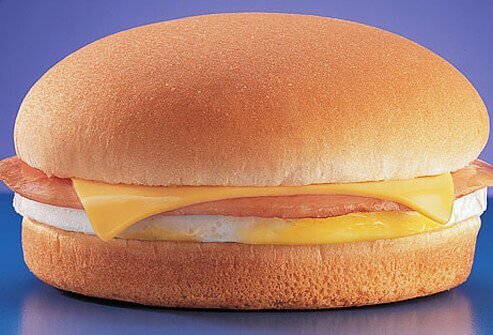 The Breakfast Jack is a hamburger bun with fried egg, ham, and American cheese. It has better nutrition numbers, with 283 calories, 11 g fat, 4 g saturated fat, and 16 g protein. As with many fast-food items, the sodium is high: 780 mg. 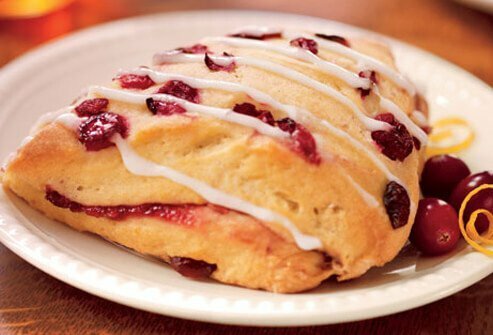 The Cranberry Orange Scone is one of several high-fat, sugary treats at Starbucks that probably won't keep you full until lunch, despite a hefty calorie count. Sweet treats like this icing-topped scone vary in flavorings by restaurant, but any scone is going to be buttery. This one has 490 calories, 18 g fat, 9 g saturated fat , 2 g fiber, and 8 g protein. 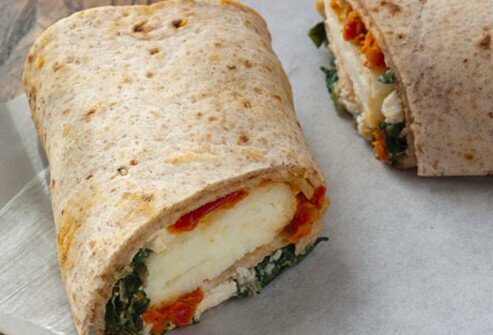 The Spinach & Feta Breakfast Wrap is a better pick. It's easy to eat out of hand and has 290 calories, 10 g fat, and 3.5 g saturated fat. Lots of protein (19 g) and fiber (6 g) help keep you full. Steel-Cut Oatmeal with Old-Fashioned Rolled Oats is another good choice at 160 calories before toppings. Or try the Greek Yogurt with Honey Parfait with 260 calories. 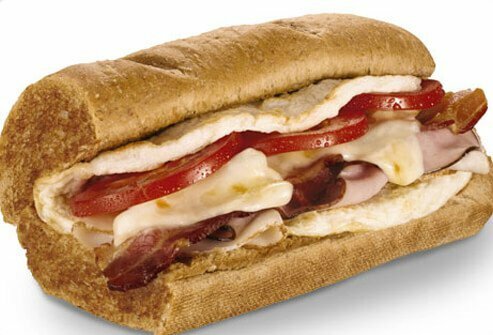 The 6" Sunrise Subway Melt can be too much for some low-calorie diets. Turkey, bacon, ham, cheese, and egg provide 32 grams of protein. But the total calories and fat run high. It has 430 calories, 17 g total fat, 7 g saturated fat, and 1,500 mg sodium. 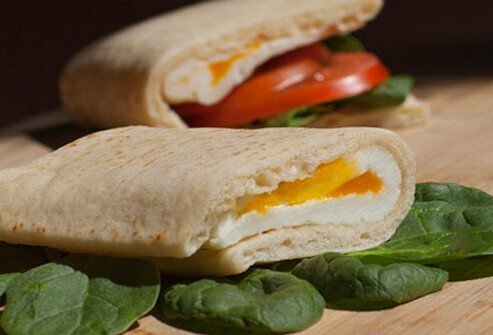 Pare down to the 3-inch Egg & Cheese Sandwich with egg whites for a better choice at Subway with 190 calories, 7 g fat, 2.5 g saturated fat, 9 g protein, 460 mg sodium, and 6 g fiber. Add tomatoes, green peppers, cucumbers, or other low-calorie choices to boost the flavor. 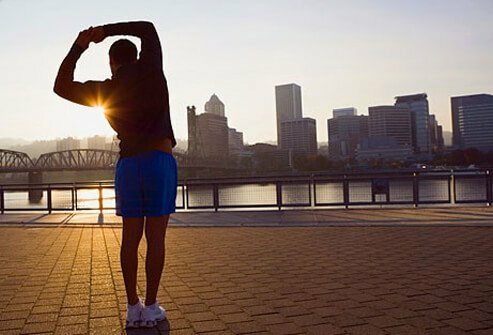 Breakfast really is the most important meal of the day -- it gives you energy to start the day and is linked to many health benefits. 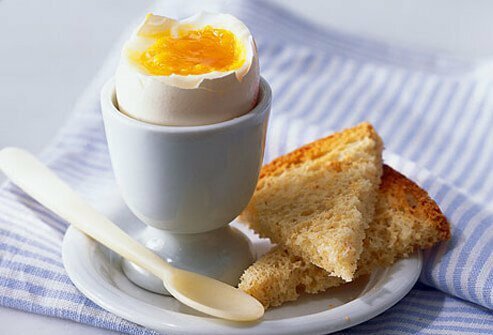 Studies show that eating a healthy breakfast can help give you a nutritionally complete diet, higher in nutrients, vitamins, and minerals; better weight control; improved concentration and performance in the classroom or the boardroom; more strength and energy to engage in physical activity; and lower cholesterol levels. 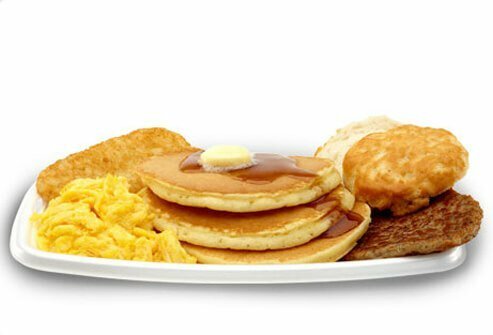 If you find yourself at a fast-food chain in the morning, opt for the healthiest breakfast options, or eat a smaller portion and save the other half. You can eat out healthfully, but nothing compares to the numerous breakfast options at home, from an egg and whole-wheat toast to a whole-grain breakfast parfait with fruit and yogurt. Short on time? Pack it the night before and take it along with you. Photo courtesy of Jack in the Box Inc.
Farshchi, H. The American Journal of Clinical Nutrition, 2005. Timlin, M. Pediatrics, March 1, 2008. Van der Heijden, A. Obesity, October 2007.